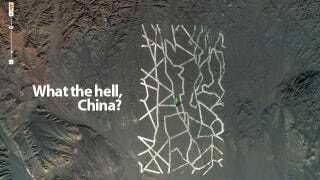 Why Is China Building These Gigantic Structures In the Middle of Nowhere? Update 1 & 2: readers are finding even more weird stuff. Update 3: some unidentified agency, company or person has been ordering hundreds of photographs of this area since 2004. Check out that story here. If you zoom in, you can see vehicles destroyed. It's west of what seems to be a fairly big electrical station or a radio station similar to HAARP, the High Frequency Active Auroral Research Program located near Gakona, Alaska, and funded by the US Air Force, the US Navy, the University of Alaska, and DARPA. You can investigate here and tell us what you think in the comments. Update: Readers are finding more weird stuff. A grid similar to the first one is located here. This one seems like another target, this time arranged radially, with planes and obstacles. Here is a weird airport-like structure. Except it's bright cyan. Seems full of water or made of a weird material. And look at the other airport-like structure next to it. Perhaps a decoy? This is a huge complex, ten by five miles at least. Are these huge precipitation pools of some kind? If you zoom in Google Maps (see the image below this one), you could see two cooling towers like those used in nuclear plants, as well as several water treatment plants. The Chinese have been building huge structures in the desert for a long time. Back in 2006, they built this 1:20 scale model of disputed border region between China and India. That's a terrain model 0.7 kilometer wide by almost 1 kilometer tall. Uncanny. Why would they build such a model of a terrain? To play a 1:20 scale war with 1:20 scale tanks? Mind boggling.